Hi everyone!! 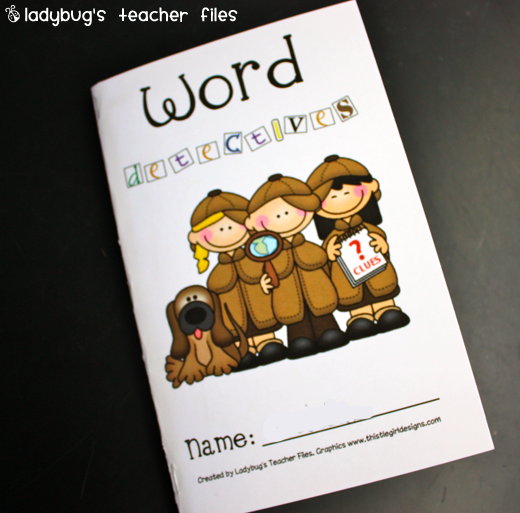 Here is Part II of my Word Detectives resource. You can read about Part I here. I finally had the chance to assemble the books and implement this system today. To display the word categories, I printed off the sign and taped it above a binder (which is velcroed to the board). This is how I display my Word of the Day charts as well. 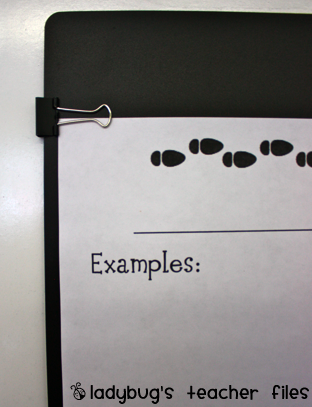 The binder creates a nice black border that makes the page pop on the board. Plus, I like that the kids can take it down and reference past pages. This will be especially important as we collect words in different categories. I put the page with the footprints and “Examples” on the top, while the lower page is blank to provide extra space for words. I want the students to have this space so they can add to the list in the future, when they encounter new words in a given category. On a side note, the pages are really easy to hold in place on the binder…I use two of those binder clips. 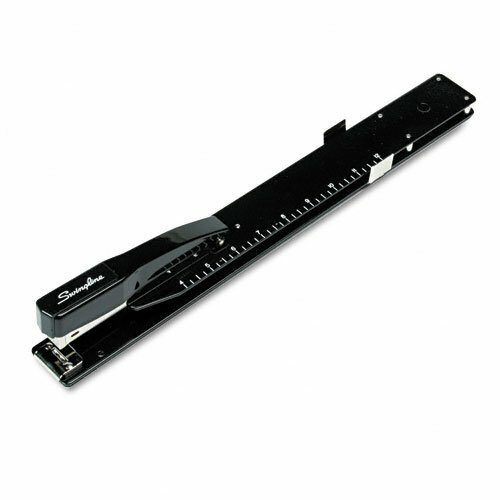 The metal part can hold many sheets of paper! So, each day, we can just flip a new page up and clip it. I just finished my running records for March and I saw many common needs among my ELL students. One of the most evident areas of need was contractions. It was clear many of the students didn’t understand the meaning of certain contractions within a story…there were also many mispronunciations due to the unfamiliarity of this language. So our introductory lesson to Word Detectives focused on contractions. We used the binder display above to write out contractions we already knew (I’m, I’ll, We’re). We discussed meanings of different contractions, used them in sentences verbally, and recorded them on the chart (they will=they’ll). I only recorded about 8 examples, since my students are 4th and 5th graders, and I wanted to keep it challenging. The students then began an independent search in their reading books from our class library. 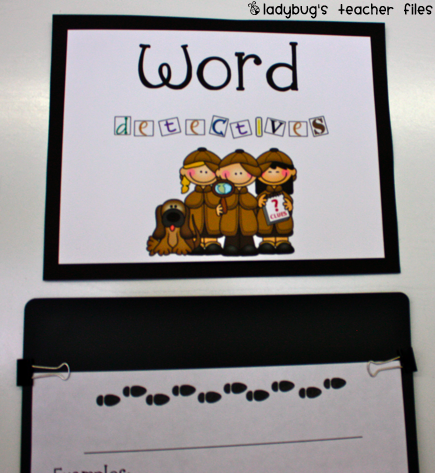 They added to their individual Word Detective books, collecting any contractions they saw (for about two minutes). Everyone was able to find a number of contractions. If the students were unsure of the meaning (she’d was tricky for instance), they just copied the apostrophe form first. Then, when we shared out, we discussed what the more unfamiliar contractions meant and added them to our whole group list. The Word Detective books were used again later in the day, during Reader’s Workshop (while the students did Read to Self). It worked out really well and my students loved it! I love how we can categorize all kinds of words and continually expand the lists (and vocabulary!). My upcoming lessons will include possessives, plurals (they tend to leave the -s off words in their reading), then move on to different word patterns/endings (such as -tion). One more picture: To create the student books, I printed the covers on cardstock and folded them in half. I then folded 10 of the book pages and stapled them inside the book (I have this stapler and I love it for this reason!!!). Another side note! I love my class…they were so excited to get new books and impressed that I made them (my students are so cute!!) and this is a mostly 5th grade class! I am attaching the entire file. The four pages include: student book covers, student book pages, a large sign for display, and pages for display. I hope you will be able to use some or all of them with your class. You are so awesome to share so many great files! Thanks a bunch! I just completed my first year of teaching, and I love your blog!! Can this work for vocabulary?? I'm going to first grade after teaching middle school the past 11 years and this will help me implement the Daily 5. Thank you so much! What font did you use for your word detective books? Thank you so much for sharing all of your hard work with us! This is perfect for what we are doing with our kids! !